San Jose State University is proposing changes to guidelines that would affect freshmen and transfer students seeking admission to the university in fall 2020 and beyond. The suggested changes include expanding the local admissions area to increase access to our unique programs for local students. The proposed admissions area expansion includes Alameda, Contra Costa, San Francisco and San Mateo counties for transfer students and these same counties plus Santa Cruz for freshmen. They also include revising supplemental coursework preferences for transfer applicants in select programs. This will help ensure transfer students have completed lower division requirements and can complete their undergraduate degrees in a timely manner. 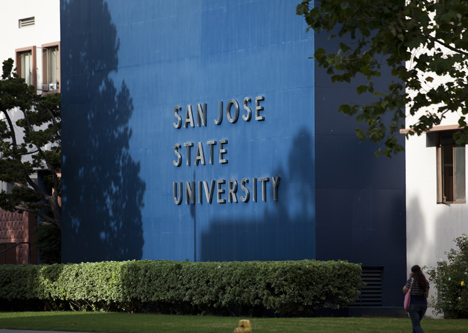 Both proposed changes are part of our efforts to improve student success at SJSU. To reiterate, the changes would be implemented as part of the fall 2020 admission cycle. The changes under consideration do not affect students who have already applied or are applying for admission for fall 2019 or spring 2020. Thursday, March 7, 6:30-8 p.m., Abraham Lincoln High School Library. 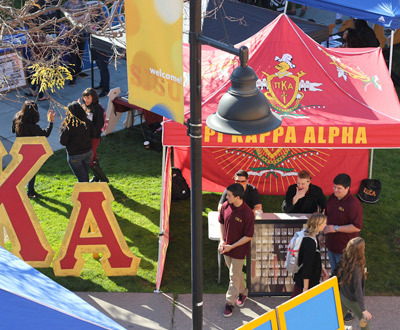 Please note that a final proposal for fall 2020 admission changes will be submitted to the California State University Chancellor’s Office for approval inclusive of any adjustments arising from public input during the meeting and hearing process. For more information on the proposed changes, visit www.sjsu.edu/impaction2020. Congratulations to all our newly admitted Spartans! (image by Rachel Poage, ’14 Graphic Design). It’s that time of year again, when San Jose State says yes to its incoming class of freshmen and transfers. 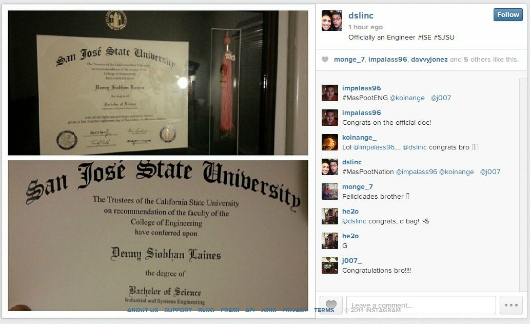 Many excited admits have already taken to Twitter, tagging their posts with #SJSUSaidYes. The new admits hail from all over California plus 37 more states, the District of Columbia and Puerto Rico. The largest number of admitted out-of-state students are from Washington, Hawaii and Texas. 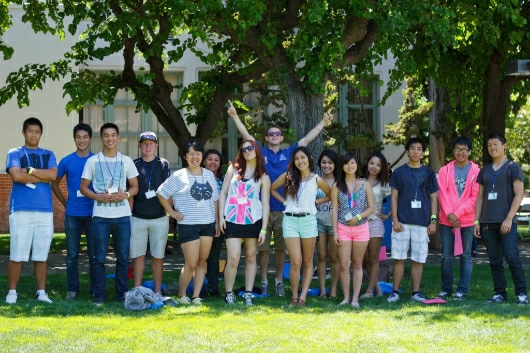 SJSU will continue to accept international applications through April 1. Admitted Spartan Day—one more chance to visit before the big decision—will be April 11. 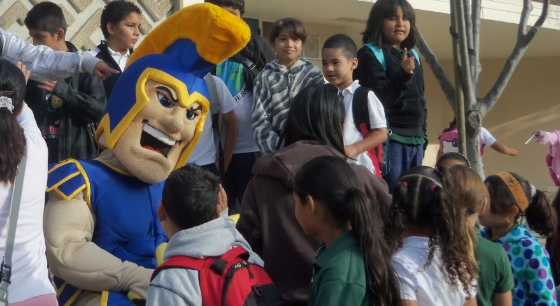 The deadline to say yes to SJSU is May 1. Keep in mind these are provisional admissions. All candidates are subject to verification of California State University eligibility via final transcripts. Everyone attends transfer orientation beginning in April or freshmen orientation beginning in June. Expect approximately 3,000 first-time freshmen and 3,500 undergraduate transfers on the first day of classes Aug. 20. San Jose State University is considering changes to guidelines that would affect transfer students seeking admission to the university in fall 2016 and after. This change does not affect students who have already applied for admission to the university. Transfers students are currently admitted based only on grade point average. 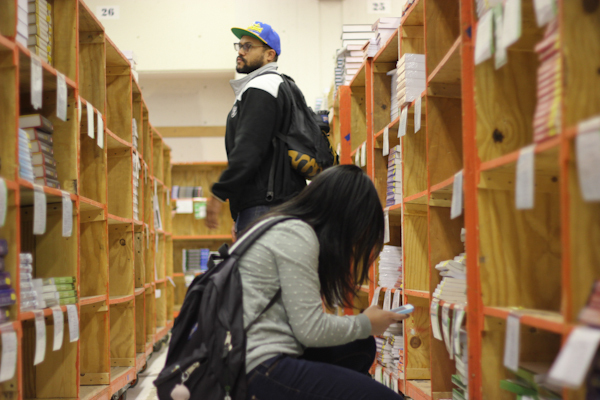 SJSU is considering evaluating transfer students applying to specific programs based on their academic preparation. These students are expected to complete certain courses prior to entering SJSU at the junior level. Our data show students are entering SJSU without fully completing the preparatory coursework, and subsequently taking longer to complete their degrees. Transfer students are enrolling in preparatory courses, limiting availability of these courses for freshman students. This change would allow more students to make timely progress to graduation. Thursday, February 26, 2015, 3-5 p.m.
Monday, March 2, 2015, 3-5 p.m.
Tuesday, March 3, 2015, 6:30-8:30 p.m.
A website has been established to provide details. Comments may be submitted online. 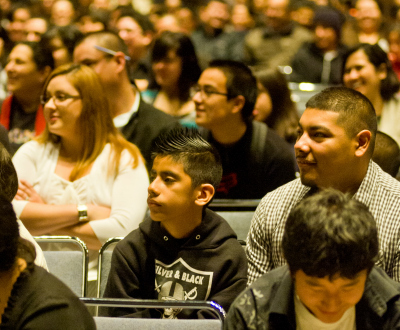 Students and their families gather at the Event Center to hear from keynote speakers at a previous ALAS conference (photo courtesy of Fernanda Karp). 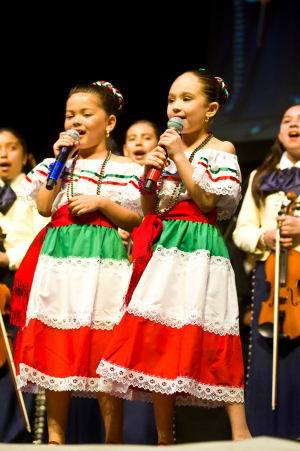 The Alum Rock Union Elementary School District Mariachi Tradicional welcomes attendees to a previous ALAS conference (photo courtesy of Fernanda Karp). The keynote speaker this year is Lieutenant Colonel (Retired) Consuelo Castillo Kickbusch, who became the highest ranked Latina in the Combat Support Field of the U.S. Army. Kickbusch is a renowned, charismatic, passionate and influential speaker with a mission to empower the next generation of leaders. Born and raised along the border in a small barrio in Laredo, Texas, Kickbusch is all too familiar with the challenges of poverty, discrimination and illiteracy. Although she grew up without material wealth, Kickbusch was taught by her immigrant parents that she was rich in culture, tradition, values and faith. The idea for this conference springs from a need to increase the number of college-bound Latino students in Silicon Valley. According to the Silicon Valley Latino Report Card 2011, 14 percent of Latinos have a bachelor’s degree or higher, as compared to 52% of non-Latinos. This event also reflects the California State University External Relations mission, which includes ensuring the needs of students with the least opportunity are recognized as a high priority. Students and their families attend workshops on academic skills, parental involvement, college-student life, and the long-term benefits of higher education (photo courtesy of Fernanda Karp). The conference will begin with a formal welcome by President Qayoumi and Mexican Consul General to San Jose Carlos Ponce followed by a keynote address by Lt. Col. Ret. Castillo Kickbusch. Then, students and their families will attend workshops on campus. Topics will include academic skills, parental involvement, college-student life, and the long-term benefits of higher education. 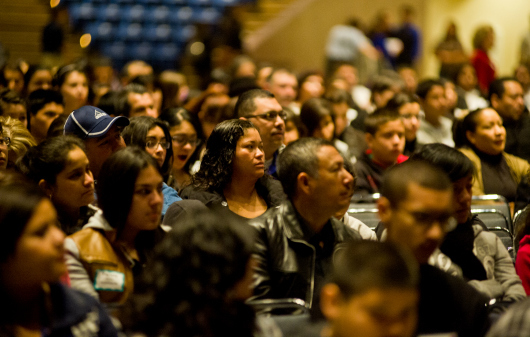 All Santa Clara County school districts were given the opportunity to invite top Latino students. The conference title, “Advancing Latino/a Achievement and Success,” was carefully selected because its abbreviation (“ALAS”) means wings in Spanish. 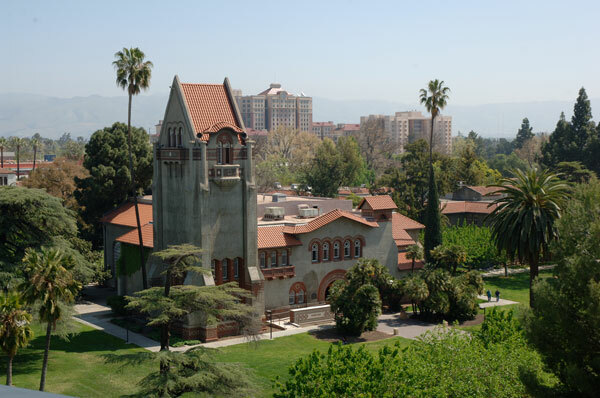 San Jose State — Silicon Valley’s largest institution of higher learning with 30,000 students and 3,850 employees — is part of the California State University system. SJSU’s 154-acre downtown campus anchors the nation’s 10th largest city. Past participants have used their creativity to take photos with others in classrooms, while flying a plane and at a daycare center. The new admits hail from all over California plus 39 more states, Guam and Puerto Rico. The largest number of admitted out-of-state students are from Hawaii, Washington and Texas. SJSU will continue to accept international applications through April 1. Admitted Spartan Day–one more chance to visit before the big decision–will be April 12. Everyone attends transfer orientation beginning in April or freshmen orientation beginning in June. If last fall is any indication, expect more than 3,600 new freshmen and 3,700 new transfers on the first day of classes August 25. More than 90 percent will be Californians, with the remaining 10 percent coming here from other states and countries. Of course, there is a long road ahead for these new Spartans but it’s worth it. Also in the mail this week? Diplomas to fall 2013 graduates. Have a question? Look for “Ask Me” stations on campus where volunteer faculty, staff and students will help you (Christina Olivas photo). Blue skies and “Ask Me” volunteers greeted the thousands of Spartans who returned to San Jose State today for the start of spring term 2014. A special welcome goes out to more than 540 new transfer students and 640 new graduate students, joining approximately 30,000 existing students. More new Spartans are on the way. 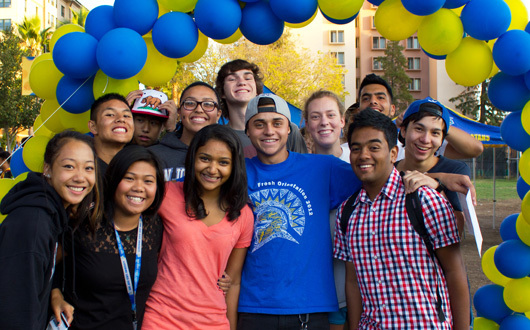 SJSU received 28,900 first-time frosh and 15,000 transfer applications for fall 2014. Don’t panic about the traffic! The admissions process typically yields around 7,000 new students each fall, replacing those who will graduate. Still, now is a great time to check out Transportation Solutions. Get your EcoPass and sign up for Bay Area Bike Share. On campus, you’ll see tons of construction underway. The good news is the Student Union west wing is nearly done. You’ll find the Spartan Bookstore there in temporary digs soon and, before long, all kinds of new eats at Union Square. Students search for textbooks in the bookstore (Christina Olivas photo). Speaking of books, it’s time to get to work. A huge shout out goes to the more than 12,000 students who have devoted 197,000 service learning hours over the past eight years to CommUniverCity San Jose. 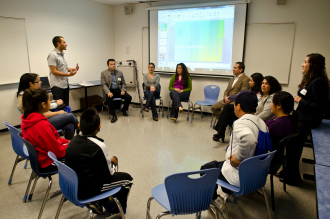 Recently honored as San Jose’s greatest civic gift, CommUniverCity helps students gain real-life experience addressing neighborhood issues near campus. In Long Beach, California State University Chancellor Tim White is preparing to deliver the first State of the CSU Address, which will be live streamed 11 a.m. Jan. 29. The chancellor will share his vision for the 23-campus system, including top policy priorities for 2014-15 to advance student achievement and degree completion. What about tuition? The governor’s proposed budget calls for no tuition increases while stabilizing state funding for the CSU. That means extra change in your pocket. You’ll find lots going on at the Event Center. Coming soon are Spartan men’s basketball Jan. 29 (free admission for students with ID) and Winter White featuring Steve Aoki Jan. 30. Of course spring term’s biggest events come at the very end: Honors Convocation April 25 and Commencement May 24. Good luck, Spartans! Thousands of prospective students and parents hit campus April 13 for Admitted Spartan Day. 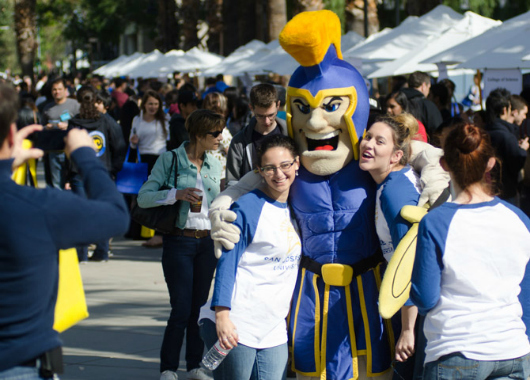 Everyone at SJSU involved with recruiting new students came out in full force to welcome incoming freshmen, transfers and their families. Among the many offerings: academic presentations at every college; campus, housing and King Library tours; and workshops on everything from financial aid to Spartan spirit. Student Outreach and Recruitment organizes Admitted Spartan Day, and produced this super cute introductory video emailed to everyone who RSVPed to the event. Have you been accepted for fall 2013? Be sure to complete the intent to enroll process by May 1! Here’s more info for frosh, and more info for transfers. You can also learn more about admissions at info.sjsu.edu. Posted by CNN Feb. 21, 2013. San Jose, California (CNN) — At 17 years old, Jessica Perez is an honor student who aspires to be the first member of her family to graduate from college. But when it came to the application process, she felt lost, alone and ill-prepared. Perez’s grandparents, who raise Perez and her two siblings, both work long hours to make ends meet. And neither continued their education beyond elementary school. Fortunately for Perez, she was directed by her school guidance counselor to a nonprofit called Strive for College. Strive for College pairs high-school students with college students for free, one-on-one consultation over a yearlong period. Each pair works together through the application process for colleges, scholarships and financial aid. “We take them through every little step of the process, because, frankly, it’s a pretty detailed process — and if you miss one step, you could ruin all your chances,” said Michael Carter, who founded the nonprofit in 2007 while he was a college freshman. So far, Strive for College has already helped 600 low-income students across the country enter four-year colleges and universities. And it expects to help an additional 900 this year. Carter grew up in an upper-middle-class suburb of San Jose, California. He attended private school throughout his early childhood, and he remembers his grandfather calling him a “menso” — basically translated to “moron” in Spanish — for claiming everyone in the United States got an equal shot at success. That pessimism started to make more sense to Carter when he transferred to a public high school in his junior year. It didn’t help that there were two guidance counselors for roughly 1,600 students. They just couldn’t devote themselves to students who failed to approach them about college — the very students who Carter felt needed this help the most. Carter designed a pilot study during his freshman year at Washington University in St. Louis. Pairing his classmates with low-income high school students at a nearby high school, he hoped to prove that college acceptance rates could be dramatically changed. The pilot’s success was astounding: 24 of the 27 seniors in the study were accepted into four-year colleges. In the previous year, the school’s acceptance rate was only 1 out of every 30 seniors. 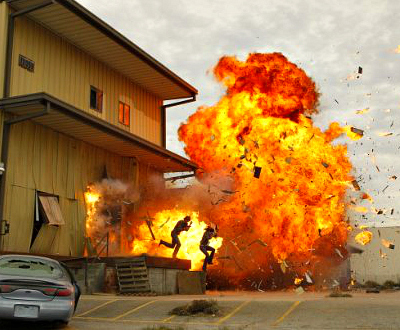 Carter found that his study was indicative of a more widespread problem in the United States. “There’s over 400,000 low-income high school seniors every year who (are) qualified to go to a four-year college, and for whatever reason they just don’t go,” Carter said. And the difference between going to college and not going to college can often mean limited career opportunities or growth. Over a 40-year career, college graduates on average make nearly $1 million more than someone with only a high school degree, according to the U.S. Census (PDF). With the help of high-school administrators, Strive for College targets youth who attend schools where 50% or more of the students are eligible to receive free or reduced lunch. To participate, students must have a GPA of at least 2.0. Interested students fill out a questionnaire about their academic and financial histories as well as their interests, abilities and ambitions. Then they can attend a “speed-dating-style” session in which they choose their college student mentor. Throughout the school year, pairs meet at the high school once a week for an hour. The process takes the students through each step: selecting their target schools, filling out applications, writing essays, obtaining letters of recommendation, targeting scholarships and financial aid, reporting test scores and completing entrance exams. Strive for College also aims to help students graduate with the least amount of student loan debt possible, ensuring stronger graduation rates and enhancing the college experience. With scholarships and financial aid, 40% of Strive students attend four-year colleges without having to come out of pocket for their tuition — compared with 32% of low-income college students nationwide. Beginning this spring, mentors and mentees will be able to communicate and track progress over the interactive “UStrive” community website. The social network will allow students to track the curriculum’s calendar and see when their peers complete major steps in the application process. Participants can make suggestions and bookmark items of interest for others. Carter has found that the social component helps students stay on track with their goals. It’s a culture that helped Shanna Brancato raise her own academic ambitions. 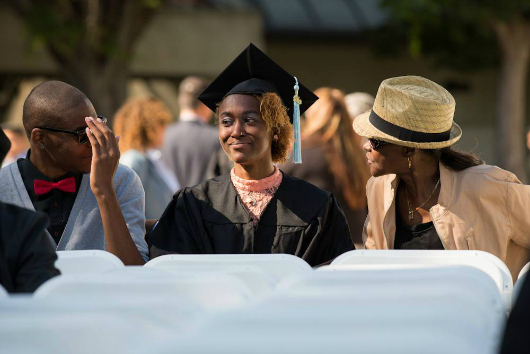 The former foster child had never considered college as part of her future when she was encouraged to attend her first Strive for College session in her junior year of high school. Many former mentees, like Brancato, become Strive for College mentors. “It’s that ‘paying it forward’ mentality that is building a Strive movement that will solve this problem, I think, within the next decade,” Carter said. Carter graduated from college in 2010 and has devoted himself full-time to his nonprofit. Strive for College now has 12 university chapters working in 15 high schools nationwide, and it is planning to launch eight more chapters this year. “The more we grow, the more students we help, the greater our impact, the bigger our movement,” Carter said. “We’ll go from changing hundreds to thousands of lives, to changing hundreds of thousands, and some day soon, even millions. Want to get involved? 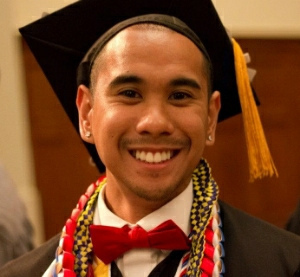 Check out the Strive for College website at www.striveforcollege.org and see how to help. All new frosh will be invited to orientation, including an overnight stay in campus housing. Working with small groups, like this one from 2012, helps break the ice and make friends (Christina Olivas photo). Good news is on the way via email to more than 27,490 prospective Spartans! 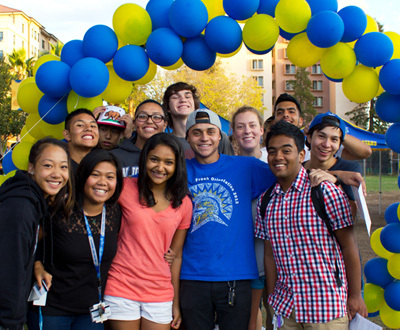 SJSU has begun sending provisional admissions notices to 17,340 new freshmen and 10,150 upper-division transfers. How to they feel about it? Well, the tweets have been especially sweet. “@SJSU I knew it felt right from the moment I stepped on campus! And now it’s becoming a reality. 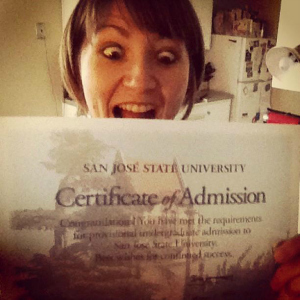 I’m so ecstatic that I got #accepted!” wrote @bernicedignacio. 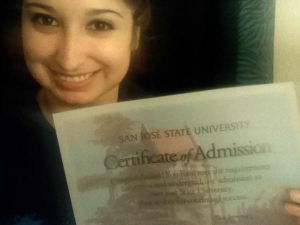 And from @xoxoKarinaH_BTR: “Woo hoo happy to say that this fall I shall attend @SJSU :D.” We’re happy too! Admissions packages will be sent via U.S. mail to frosh and transfers beginning Feb. 26. Graduate and international admissions are still underway. You can follow the action on the SJSU Enrollment Services Facebook page. Coming up next is Admitted Spartan Day on April 13, when we’ll open campus to to all prospective students and their families. Then there’s the national intent-to-enroll deadline on May 1. 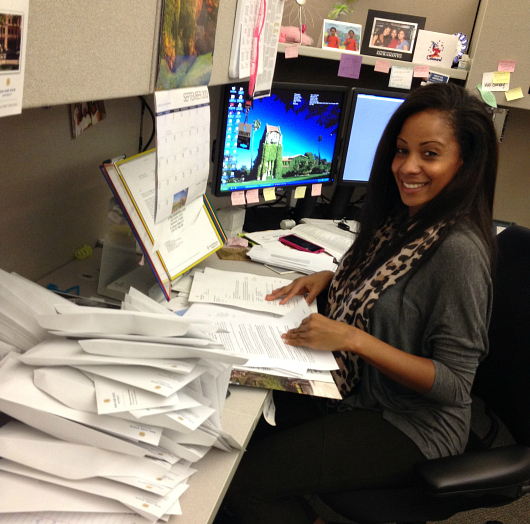 That’s when students let colleges and universities know their final decision on where they’re headed for fall 2013. All new frosh and transfers will be invited to orientation, including an overnight stay in campus housing for all frosh during weekly sessions this summer. We’re still fine tuning our forecast for fall 2013, but during fall 2012, SJSU ended up enrolling more than 3,400 frosh and 3,100 transfers. Unfortunately, SJSU did make the very difficult decision to turn away 6,500 applicants who failed to meet impaction thresholds in their chosen majors. San Jose State continues to receive far more applications for admission than can be accommodated due to state budget cuts. Admissions impaction criteria remains in place, which means applicants are admitted into their majors on a space available basis. The good news for those who were admitted is Proposition 30 seeks to minimize tuition increases. View current SJSU tuition and fees. How crowded will campus be next fall? 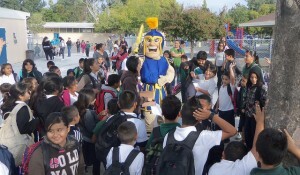 Expect the same as this fall, given strong applicant interest in SJSU (Christina Olivas photo). 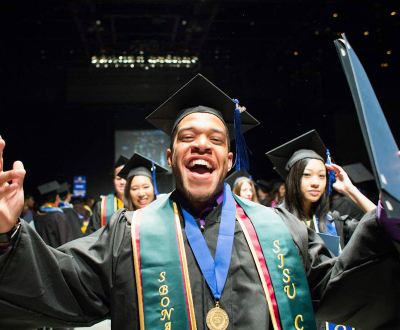 Demand for an SJSU degree remains super strong, with more than 43,000 students applying for admission in fall 2013 as freshmen, transfers or credential candidates by the Nov. 30 deadline. This number will grow given SJSU is still accepting applications from international, graduate and doctorate of nursing practice candidates. Apply now. So far, more than 27,000 students have applied for admission as freshmen, a nearly 10 percent increase over last year. More than 15,300 students have applied as transfers, jumping nearly 22 percent over last year. This was likely driven by pent up demand from community college students given SJSU was forced to close for spring 2013 admissions due to the state budget crunch, a situation the passage of Proposition 30 could alleviate. How many fall 2013 freshmen and transfer applicants will end up enrolling? 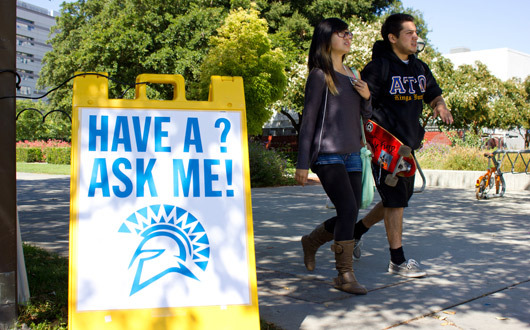 In fall 2012, SJSU enrolled nearly 7,000 freshmen and transfers. Also notable was the surge in credential applicants. More than 1,300 people applied for admission to SJSU’s Connie L. Lurie College of Education credential programs, up more than 12 percent from last year. Many factors may be contributing to the overall surge in applications, including demographics, the value of a college degree, relatively low tuition and fees, the online application process through CSU Mentor and, for SJSU, a superb location in Silicon Valley and near all Northern California has to offer. Read a related CSU news release. More than a hundred elementary, middle, and high school students from throughout Santa Clara County gathered at SJSU Sept. 27 for the College Day 2012 kickoff (Jessica Olthof photo). 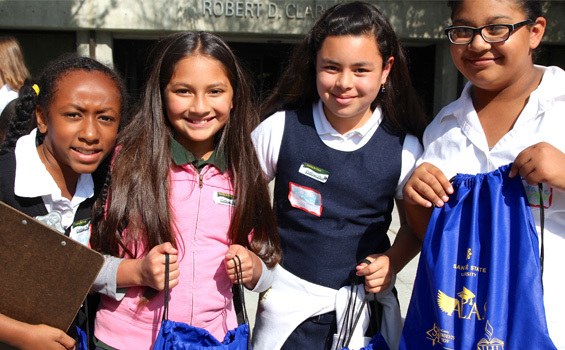 More than a hundred elementary, middle, and high school students from throughout Santa Clara County gathered at SJSU Sept. 27 to hear from a variety of speakers about their college experiences, kicking off College Day 2012. “By sharing the diverse education paths of some of our top leaders in the community with many first generation students, we hope to inspire them to design a path to college for themselves,” said Kim Guptill, College Day Chair. 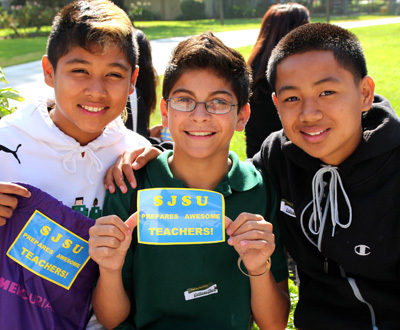 Learn more about applying to SJSU. The crowd itself was an inspiration. Among the young people in attendance were over 30 Overfelt High School students, including 20 juniors, enrolled in their second year of calculus, a huge achievement for college-bound students, especially those from what is perceived to be a tough neighborhood. “We like to say every day is College Day,” said Overfelt Principal Vito Chiala, noting that offering Calculus II on a high school campus where most students qualify for free and subsidized lunches shows that young people everywhere can achieve. Mark L. Walker, managing director, Global Community Affairs, Applied Materials Foundation, the event’s premier sponsor, shared with the young people in the crowd that like many of them, he was a first-generation college student. “College really made me into who I am today,” he said. He urged students to get involved, recalling how “he learned all sorts of leadership skills” as a college newspaper business manager and fraternity president. He reminded the crowd that Silicon Valley remains one of the best places in the world for a college graduate, with one percent unemployment in leading fields such as electrical engineering. Walker recalled he started out in life dreaming of playing for the NFL, and then later deciding he would emulate TV lawyers before taking his first business class in college. He went on to graduate from Georgetown University. But one of the greatest lessons he learned came from his grandfather, who dropped out of middle school. Liccardo went on to devote his life to public service, working as a prosecutor of sexual assault and child exploitation crimes in the Santa Clara County District Attorney’s Office before running for public office. “Achieving something more, not becoming something different,” was also on the mind of Limbergh Arceo, the second Calculus II Overfelt student to address the crowd. Although his childhood was challenging, his mother “always encouraged me” to do well in school. So he hit the books and even considered attending a college prep private high school. But after taking summer classes at the private school, he decided to stick with Overfelt, which he argues offers even more rigorous academics. He added he was dressed casually although he was a College Day kick-off speaker to bring home the point that it is not what you look like or where you are from that counts. “We are just as smart as the other students, and can achieve the same level of success,” he said. On Oct. 1, all 23 CSU campuses including SJSU will begin accepting applications from new students for admission to the fall 2013 term. San Jose State will continue accepting applications through November 30 from new undergraduates who would like to attend SJSU beginning in fall 2013 term. New students should visit www.csumentor.edu to complete an application. 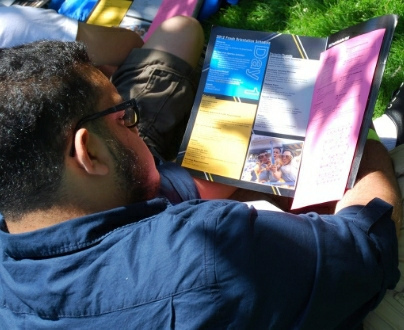 Future Spartans can also download SJSU’s beautiful Fall 2013 Guide to Admission brochure. The next step after applying is completing a Free Application for Federal Student Aid (FAFSA). Nearly half of Cal State undergraduates receive enough in financial aid to cover the full cost of their tuition. CSU tuition remains among the lowest in the nation. View current SJSU tuition and campus fees. SAN JOSE, Calif. – One hundred elementary, middle, and high school students from throughout Santa Clara County will gather at San Jose State University to kick off College Day, starting at 9 a.m. on September 27, on the lawn between Clark Hall and Tower Hall, near the Sculpture Garden featuring the sculpture of SJSU Olympians Tommie Smith and John Carlos. The youngsters will hear from a variety of speakers about their college experiences. “By sharing the diverse education paths of some of our top leaders in the community with many first generation students, we hope to inspire them to design a path to college for themselves, whether they are fifth graders or are seniors in high school,” said Kim Guptill, College Day Chair. College Day is a county-wide college-going effort on September 28, spearheaded by the volunteer-led First-Generation College Attainment Coalition. The goal of College Day is to create a college-going culture in Santa Clara County and help our children and youth plan and design their path to college. This happens when educators, youth workers, parents and other adults engage children in conversations, lessons, and other college-promoting activities. The September 27 kick-off will introduce College Day to the entire county. 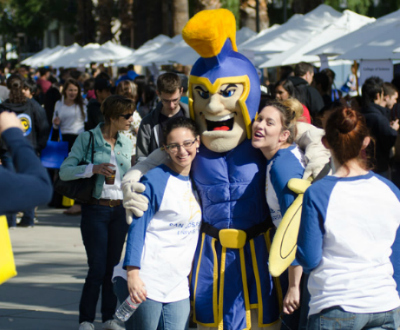 Learn more about applying to SJSU. SJSU President Mohammad Qayoumi will welcome the students, and share his path to college, followed by Mark L. Walker, managing director, Global Community Affairs, Applied Materials Foundation, the event’s premier sponsor. Other speakers include Dr. Xavier De La Torre, Santa Clara County Office of Education superintendent; Elaine Chin, dean, Connie L. Lurie College of Education at SJSU; Dave Cortese, Santa Clara County supervisor; Sam Liccardo, San Jose city councilmember; Overfelt High Schools students, and San Jose State University first-generation college students. NBC Bay Area News Reporter Damian Trujillo will serve as master of ceremonies. 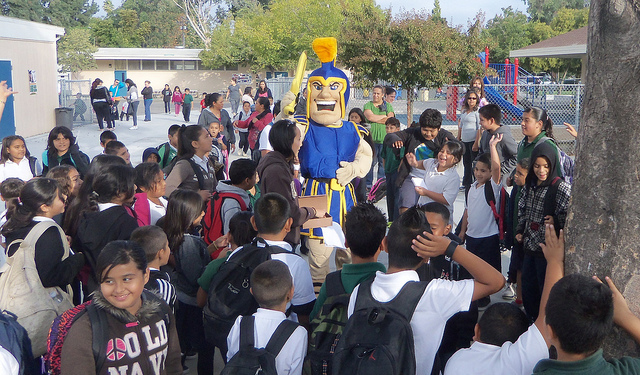 SJSU’s beloved mascot, Sammy Spartan, will make an appearance. Across the day and throughout the valley, classrooms, hallways and doors will be decorated with college banners, educational posters and inspirational messages, encouraging students to aspire to go to college. Teachers will begin their day leading students in designing their college paths, and continue by creating College Corners in their classroom. Every student in Santa Clara County will be given a College Day sticker, and every classroom an “Every Day is College Day” poster. College Day is sponsored by the Applied Materials Foundation, San Jose State University, Kids in Common, Downtown College Prep, Robert Grimm, Lynda Greene and Councilmember Sam Liccardo. Organizations and people who have collaborated to make College Day a reality include: Advancement Via Individual Determination (AVID), ALearn, Breakthrough Silicon Valley, College on Track, CommUniverCity, FIRST 5, Franklin McKinley Children’s Initiative, GoVoluntr, Parent Institute for Quality Education (PIQE), Office of the Mayor (City of San Jose), Sacred Heart Community Services, San Jose Public Library, Santa Clara County Office of Education, Silicon Valley Leadership Group, Summer Search, University of California Berkeley, Center for Educational Partnerships (Destination College Advising Corps) and University of California, Santa Cruz, Educational Partnership Center (San Jose Cal-SOAP). Photo opportunities for members of the media will include students asking questions of President Qayoumi and Overfelt High Schools students speaking. On Aug. 16, as a guest on KQED’s news talk show “Forum,” President Qayoumi explained that millions of dollars in state budget cuts for public higher education means SJSU lacks the funding to admit all California residents who would like to attend. In the past, this time of year was when SJSU accepted applications for spring admissions, mostly from community college transfer students, but also from graduate students entering programs accepting newcomers in the middle of the academic year. Beginning in 2009, when SJSU was hit by severe budget cuts, spring admissions varied depending on the budget situation and the number of enrolled students. This fall, SJSU has already filled every spot available to California residents for the entire academic year, meaning California residents are filling all seats supported by a combination of state and tuition dollars. So SJSU opened spring admissions to only non-resident graduate students from elsewhere in the United States or abroad who cover the full cost of their education in higher tuition without state support. This touched off a series of stories in the major media, including the San Jose Mercury News and KQED news radio. Is this fair? Who is to blame? On Aug. 16, as a guest on KQED’s news talk show “Forum,” President Qayoumi explained that millions of dollars in state budget cuts for public higher education means SJSU lacks the funding to admit all California residents who would like to attend. Listen to the show.